With the on-going depletion of fossil fuels, the rise in greenhouse gases, the issue of how to make clean, safe and affordable energy remains a critical concern. Following seminal work by Nobel laureate Jean-Marie Lehn and others in the 1980s, photocatalysts -- materials that convert light to energy -- have been increasingly explored as an efficient way of breaking down carbon dioxide (CO2) into useful, high-energy molecules. Compared with conventional approaches such as thermal catalysis, for example, photocatalysts have the advantage of not requiring costly procedures such as high temperatures and pressures. Now, a research team led by Kazuhiko Maeda at Tokyo Tech has developed a new nanomaterial capable of reducing CO2 with a selectivity(Term.a) of 99% and a turnover(Term.b) number of more than 2000, outperforming existing methods. These results are the highest recorded under visible light and in water, bringing Maeda's team a step closer to the goal of artificial photosynthesis -- the design of systems that replicate the natural process of using sunlight, water and CO2 for sustainable energy production. 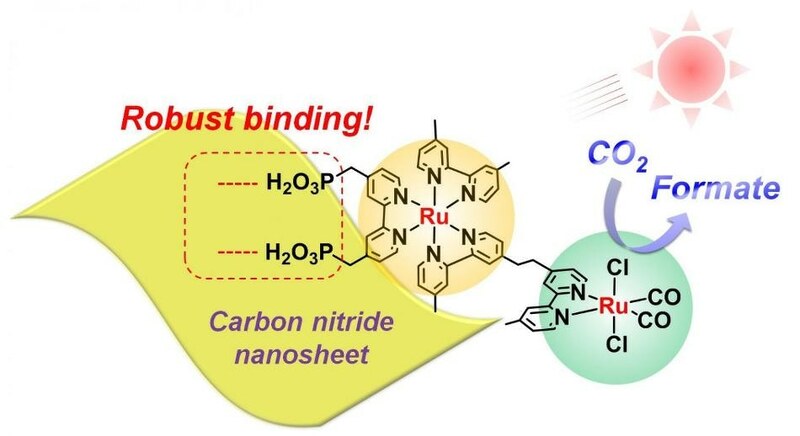 The new material, reported in Angewandte Chemie, consists of high-surface-area carbon nitride nanosheets combined with a metal structure known as a binuclear ruthenium(II) complex (RuRu'). Although different kinds of metal complexes are known to promote CO2 reduction, Maeda says that RuRu' is currently "the best-performing one" but needs to be replaced with precious metal-free counterparts in the future. What makes the material unique is the extent to which the RuRu' binds to the nanosheet surface. Strong binding improves electron transfer, which in turn improves CO2 reduction. In the study, up to 70% of the RuRu' was found to be attached to the nanosheets -- an unprecedented figure, Maeda explains, given that the carbon nitride surface is thought to be chemically inert. "This has been a big surprise in our research community," he says. Also, to optimise performance, Maeda's team modified the nanosheets with silver, which plays an important role in improving electron capture and transfer efficiency. The research opens up new possibilities for carbon nitride-based photocatalysts, as they work not only in water but also various organic solvents, which can be transformed into value-added chemicals such as aldehydes in the chemical industry. "Until very recently, it seemed impossible to achieve CO2 reduction under visible light in aqueous solution with high efficiency," says Maeda. "Our new result clearly demonstrates that this is indeed possible, even using a low-cost carbon nitride-based material." One of the next challenges for Maeda's team is to design photocatalysts consisting of earth-abundant metals such as iron and copper in place of the rare metal ruthenium.